Through powerful distance learning and collaborative technologies, we help make your educational organization effective and successful. Through proven cirriculum development and operational procedures, we ensure your institution is ready to meet the most rigorous accreditation requirements. We are experts in the design and implementation of powerful and comprehensive interactive distance learning (IDL). We understand that the selected technology needs to fit your organization's budget, curriculum, faculty makeup and ultimately improve student learning outcomes. If your organization already leverages distance learning technologies, we help you assess its effectiveness, identify improvements and implement operational procedures to make it all more effective. If your organization is implementing distance learning for the first time, we help you select a solution that is right sized to your needs. We can assist in navigating licensing requirements, developing curriculum, faculty training and standard operating procedures. If required, we also provide on-going support and maintenance to ensure your IDL is an on-going success. Through proven curriculum development and standard operational procedures, we ensure your institution is ready to meet the most rigorous accreditation requirements. We assist with site visit readiness, gap analysis, best practices, continuous improvement strategies, policy review and development, expert guidance on adverse actions, preparation of annual and periodic reporting, retention and placement strategies and employer engagement. We build successful online communities to better engage educators and students. We use social media paradigms that are familiar to the average user and allows them to easily become familiar and contributing to the community. Hosting online communities can be monetized through subscription-based membership, school product sales and educational content. Building a loyal community also ensure better awareness and marketing of your institution's missions and events. We build hardened business-class applications for both internal and external cloud-based users. If your organization integrates with the healthcare industry, we are experts in building solutions that are HIPAA compliant from a software, hosting and administrative perspective. Our HIPAA and HITRUST cloud hosting solutions guarantee PHI protection, breach monitoring, vulnerability assessment reporting and failover services. You have 7 seconds to engage new web visitors before they move on. We make those 7 seconds count. We partner with you to optimize your web presence. Your visitors will quickly and clearly understand your mission and your site will drive them to new enrollments. We are experts in successful and marketing-minded web development, graphic design and copyrighting. We extend your interactive distance learning and web presence to sell online educational content, products or offer paid memberships. Our comprehensive reporting tools then allow you to measure and correlate the marketing efforts that converted into these sales. A key component of any fundraising initiative is getting your organization in front of new donors. For the last 10 years, we have been successfully managing the online marketing campaigns and related spend for causes like yours. Our strategy includes a strong focus on pay-per-click (PPC) advertising and search engine optimizations (SEO). In partnership with your marketing team, we determine the best keywords, ad copy, targeting and organic website optimizations that drive search engine visitors to your website and its fundraising campaigns. We review the keywords and audience you wish to target in your campaigns. This process includes research of your competitors and their keyword usage. We then identify keywords with less competition, yet receiving high search rates. This ensures the lowest possible cost-per-click rate. This results in more clicks and ultimately conversions for your given budget. We then construct effective ads that incorporate your keywords and guarantee relevancy between your users' search terms, the ads they see and the website they click through and visit. We are laser-focused on conducting on-going analysis, refinement and reporting of your online marketing efforts, their effectiveness and return on your marketing spend. We use tools including Google Analytics, Google Adwords and Bing Ads to aggregate your various online marketing campaigns into a consolidated reporting and analysis view. 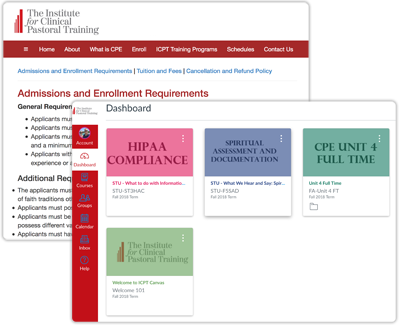 Correlative worked with the Institute of Clinical Pastoral Training (ICPT) to implement a comprehensive online presence and Canvas interactive distance learning (IDL) solution for its online curriculum. This project was required to qualify the institute to for ACCET accreditation, which was successfully awarded in 2018. The Accrediting Council for Continuing Education & Training (ACCET) is a group of educational organizations affiliated for the purpose of improving continuing education and training. ACCET is recognized by the U.S. Secretary of Education and is listed by the U.S. Department of Education as a nationally-recognized accrediting agency. Correlative was responsible for the design and implementation of the Canvas IDL, public web presence and ecommerce components. In addition, Correlative worked side-by-side with ICPT's senior management, faculty, director of academics and accreditation consultant to deliver an online classroom experience that adheres to the most innovative standards of technology-based education and procedures highly recognized by the U.S. Department of Education. Correlative partnered with Spiritual Care Association®, an international professional membership association for spiritual care providers, to develop their online community and Canvas interactive distance learning (IDL) solution for its online curriculum. 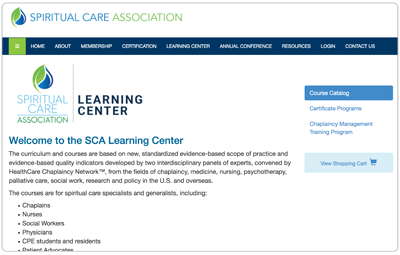 Through its online community, The Spiritual Care Association® provides membership-based certification, resources and Canvas distance learning curriculum. Online curriculum is purchased and registered via the site's ecommerce-based Learning Center. Correlative provides on-going application development, Canvas administration and website maintenance for the Association.